New England Coastal Wildlife Alliance (NECWA) is a non-profit environmental organization based in southeastern Massachusetts. NECWA is an all-volunteer organization that is dedicated to the protection and conservation of marine wildlife that live and feed in the coastal waters of the Gulf of Maine. All fundraising events help support NECWA's many projects and activities related to educational outreach, research, and conservation. NECWA is an all-volunteer nonprofit, so 100% of all donations goes back into the work we do on behalf of marine wildlife. NECWA is an all-volunteer nonprofit based in southeastern MA. This organization combines educational outreach with research and conservation activities to protect and rescue marine wildlife in the coastal waters of New England. Internships provide opportunities for high school and college students to gain experience in the field of marine science. Research collected from our many projects is used to enhance our understanding of the unique marine wildlife found off our shores. Data collected from these projects is shared with researchers in the United States and worldwide to support conservation and management efforts. NECWA also oversees a rescue program for ocean sunfish that strand each fall and early winter along the shores of Cape Cod. NECWA is a 501(c)3 organization. Help support activities sponsored by the New England Coastal Wildlife Alliance by making a tax deductible donation today. NECWA sponsors 2 community-sighting networks asking people to report their sightings of basking sharks, ocean sunfish and diamondback terrapins that they see from a boat or from a beach. Click on the links below to report your sighting and add your observations to our long-term sighting database. This information is helping biologists and scientists better understand and protect the unique coastal marine wildlife that lives off the shores of New England. 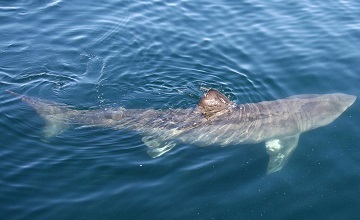 Use this form to submit your sighting of a live or dead basking shark that you saw from a boat or from the shore. 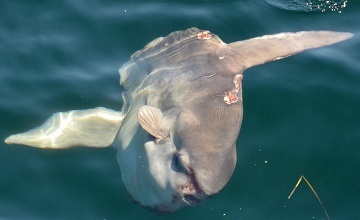 Use this form to submit your sighting of a live or dead ocean sunfish that you saw from a boat or from the shore. 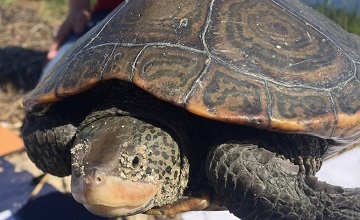 Use this form to submit your sighting of a live or dead diamonback terrapin that you saw from a boat or from the shore. 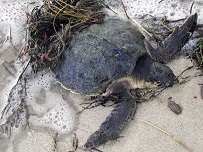 Marine wildlife occasionally strand along the shores of New England, including bays, rivers and tidal marshes. If the stranded animal is alive, it is important to get experienced personnel on site as soon as possible. If the stranded animal is dead, then various organizations will want to examine the carcass to support their research and management efforts. For information on the government or non-government organizations in your area that respond to strandings, as well as the dos and don'ts for responders, visit our Marine Wildlife Stranding page.